It could all begin so innocuously. 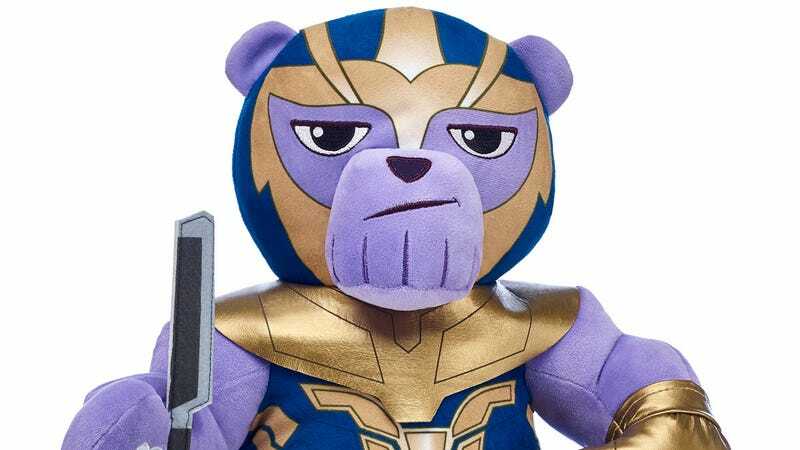 You find yourself wanting to get a token of appreciation for the special child in your life—a gift that really screams “time is horrifically fleeting.” You surf the internet and before long, you spot it: the fully outfitted Online Exclusive Thanos Bear from Build-A-Bear in all its purple glory. And what joy, it has sound! So you spend your $47 and hand the child Plush Thanos—which they hopefully accept with the appropriate level of apprehension—and they press the sound box. “If you cannot retrieve the orb, don’t bother coming back. I will find you.” Fair enough. Who doesn’t love an adorably ominous (and assumed) throwback to Guardians Of The Galaxy? And that’s where the path to wild speculation begins. Is this a line from one of the many battles, and does this mean that someone gets close enough to the gauntlet just before their demise? Is this simply a muddled summary of events explained to the toy manufacturer by Marvel? Hell, is this just a product of the same brand of guessing that all of us have engaged in for almost a year? Who knows, but the idea of Snappington Bear holding some of Marvel Studios’ most tightly guarded secrets is as miraculous as the gift itself. We say all that to warn that if you plan on grabbing this adorably stuffed slaughterer anytime soon, make sure to proceed with caution.